Lifelong member of St. John’s Evangelical Lutheran Church, Eagle Lake, IL. He also served as Church Deacon. 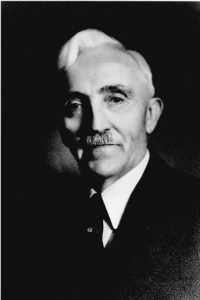 Henry was the first man in Will County to import thoroughbred Percheron Horses directly from France. 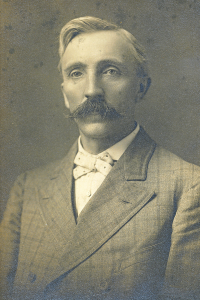 His reputation as a judge of horses and his knowledge of veterinary matters was known throughout the county, and his advice was sought by hundreds of people. In addition to his many accomplishments, he was a member of the School District Board, Washington Township Supervisor, Assessor and Justice of the Peace, an Officer and member of the Board of The Crete Mutual Fire Insurance Co. and Director and President of the Eagle Lake Brick & Tile Works. 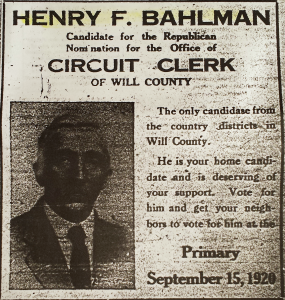 H.F. Bahlman, candidate for the Republican nomination for county clerk, is just about the busiest man in Will County, just now, canvassing in the interest of his campaign, he reports that he is meeting with gratifying encouragement in every section he visits. 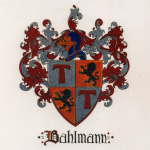 Mr. Bahlman is too well known to our readers to need an introduction as to his life’s history. He is known for his honesty and integrity, and is well qualified to assume the duties of the office he aspires to. Every voter in the town of Washington and Village of Beecher–Mr. 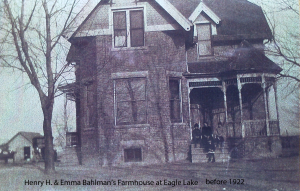 Bahlman’s home–should favorably consider his candidacy, not for the one reason that he is a home candidate, but because he is the only candidate for a county office in the eastern part of Will County, and because he is admirably fitted for the office of county clerk. 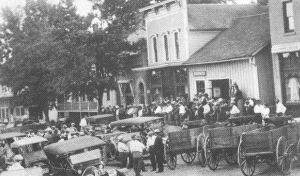 In August of 1913, about 350 farmers listened to a representative from the Will County Crop and Soil Improvement Assoc. Speakers urged farmers to plow under their clover crop instead of harvesting it, thus providing fertilizer to the soil for higher corn yields. H.F. Bahlman, H.F. Thielman, Ed Rump, and Welton Ehrardt were among the Beecher farmers who filled 75 automobiles for a tour of Will County farms that day. H.F. Bahlman will represent Washington Township on the county board, winning by a large majority at the Republican caucus held, Saturday afternoon, at the Clark-Struve hall. The contest for which great interest and the result was eagerly awaited. Both gentlemen ran on a Republican ticket and both asked the support of the Republicans. Mr. Bahlmann promises to work to the interest of the township on the board and in accord with the wishes of those who voted for him. The caucus is the only one held in the township and the choice is usually decisive. Carl Ehrardt, chairman of the caucus, gave a short talk explaining the proposed bonding of the township for hard roads, which was intently listened to by the citizens and evidently met the approval of a large majority present, as many voluneered to sign the petition. The caucus was one of the largest held in Beecher in years, nearly all voters of the township participating. Death marked the finish to the careers of two men, whose aggressiveness and resulting accomplishments are vividly recalled by citizens of this community. They were men of action and pioneers in many respects in their activity in civic and business life in this community. Funeral services for Henry F. Bahlman, outstanding farmer and prominent citizen of this community for many years, Sunday afternoon, at the Hack Funeral Home and following at St. John’s Evangelical Lutheran Church at Eagle Lake, were conducted by Rev. Carl F. Selle. Interment was in the Beecher Mausoleum. The deceased, who had been making his home with his daughter in Chicago Heights, suffered a stroke two years ago. A second stroke, March 3, made hospitalization necessary; and a third stroke, six weeks ago, finally brought a close at 8:00 o’clock, Friday morning, a long, full life, at the age of 83 years and 11 months. 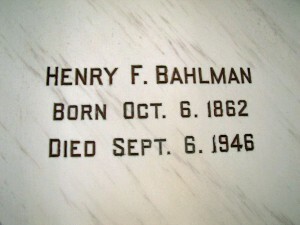 He is survived by three daughters, Mrs. Henry Wegert, Chicago and Mrs. Arthur Hinze and Mrs. William Hildeman of Chicago Heights: two sons, Dr. Henry and Donald W., four grandchildren and a great grandson; also a sister, Miss Lena Bahlman; and the following in-laws: Mrs. M. Bahlman, Mr. & Mrs. Gust Hahn and Ferdinand Oberheide. Preceding him in death were a daughter, Carolyn, who died in 1924; and his good wife, who passed away in Sept. 1934. 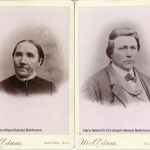 Mr. Bahlman was united in marriage with Emma Wehmhoefer, May 25, 1890. For many years he successfully operated a farm in the Eagle Lake community. Throughout his career, he was active in both church and civic affairs, having been a member of his district school board and supervisor and justice of the peace of Washington Township. He also served for a long period as an officer and member of the board of the Crete Mutual Fire Insurance Co.
Editor’s notes: The other citizen mentioned in the headline was: Henry G. Wehrmann 1902-1946. Another prominent citizen in the young automotive dealership industry. This entry was posted in Automated Burial Listing, HEADSTONE, Obituaries- Have Full Copy, Public Service, St. John Evangelical Lutheran Church - Eagle Lake by Sandra. Bookmark the permalink. 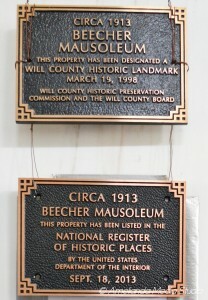 Maintenance of a historical site like the Beecher Mausoleum requires caring volunteers and generous donors. An Illinois mausoleum that is on the national register of historic places and a Will County Historic Preservation site.